Costa Rica's latitude and longitude is 10° 00' N and 84° 00' W . Below is the map of Costa Rica showing major towns, roads, airports with latitudes and longitudes plotted on it. Costa Rica is located within the latitude and longitude of 10° 00' N, 84 º 00' W. Costa Rica is situated in the north- western hemispheres. Costa Rica is located in North America. The capital city of Costa Rica is San Jose. 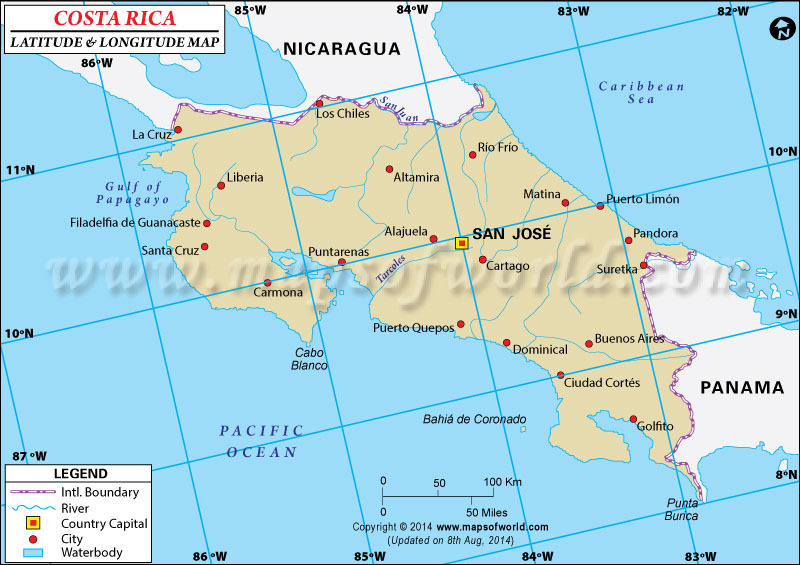 The latitude and longitude of San Jose, the capital city of Costa Rica is the 9º 56' N, 84º 05' W.
The climate within this latitude and longitude of Costa Rica is tropical in nature. In general terms, weather condition remains pleasant throughout the year. Prevalence of trade winds helps to cool down much of the coastal areas of Costa Rica. The hottest months are March, April and May whereas; the cooler months are December, January and February.